It’s so hard to sit down and watch this whole thing go to absolute hell, but here we go. Luke refuses to tell Lorelai about April, and doesn’t even really give us a decent reason for keeping them apart. It doesn’t help that we see him attempt to tell Lorelai in these episodes exactly twice, in what apparently is over the course of two months. One fails because he is so evidently overcome by Lorelai in her wedding dress, and the other because she happens to be busy that day. In two months. Can’t really blame her for being as pissed as she is. DP: Look, we’ve been working for the last two years with one-year contracts, working seven days a week for the past six years, and we wanted not a two-year pick-up for the show, but a two-year contract for us, so we could relax a little bit and not just think 300 days at a time, always wondering whether we’d be here. And we hit a brick wall with that, and also with our request for more personnel, more writers, a staff director for the [stage set] so that we didn’t personally have to go down on the set and oversee the directors and make sure the knickknacks were on the right shelf at Lorelai’s inn. So last Thursday, when we saw none of that was coming together, we made our decision [to leave]. ASP: We went to the studio around the Christmas holiday and said, “Here’s what we’re looking for and let’s talk now before the season ends and things get crazy with [your] attention distracted by fall pilot development,” but we got frozen out. It was like Footloose, when they’re revvin’ up the tractors, playin’ chicken. It took too long and before everyone knew it, we were loading our desks on a truck and driving off the lot. Okay. Fair enough. So it seems like the pair knew that they were likely on their way out. They knew for sure after the holiday break (these episodes are the first ones after season six’s winter hiatus), but the horrific April plot was already in play. They also knew that, with the move to the then-new CW from the WB network, the show was bound to continue without them, as it was a reasonably successful ratings magnet. So- Did they want to tear it down? Did the Palladinos screw up Lorelai and Luke so spectacularly that the new crew would have to spend all of season seven to fix it? Would they really do that to a property they created and supposedly loved? I can’t really believe it—but I also can’t believe that a pair of storytellers as gifted as these two would come up with the April plot, the most hackneyed way to keep a pair apart since Holden impregnated Julie during a one-night stand on As The World Turns, messing up his relationship with Lily. It staggers the imagination, and yet, here we are. Lorelai crafts the perfect wedding even as the whole thing is doomed for failure and will not reach fruition for at least a decade. Rory’s back in the mix (sadly, Richard and Emily are not, and their loss is palpable), and while Alexis Bledel has scarcely looked better with her swinging ’60s haircut, her acting in these two episodes is almost unbelievably bad. I think it was pointed out in the comments how bad her fake crying was in a previous funeral scene, but that psychiatrist scene: wow. They couldn’t have thrown some Visine on her or something? Also, what did she think the psychiatrist was going to ask her about? Of course he was bound to bring up her criminal record. Even after all those hours of community service, Rory still doesn’t get it. "The Perfect Dress"/"Just Like Gwen And Gavin"
Neither does Logan, apparently, considering his borderline stalking of Rory (which eventually gets rewarded, naturally). If someone has unlimited funds, how much should bushels of flowers really matter? Still, at least he’s savvy enough to realize that the only path he has left to Rory is through her mother, and so seeks her out. But then Bledel can’t even manage a decent laugh while reading Lorelai’s letter. It’s really odd. Obviously, things eventually improved enough for her to get that Emmy for her amazing work in Handmaid’s Tale, but sometimes it is pretty obvious that Gilmore Girls was her first acting job. Paris is also clueless: Although she’s right about how tough working at a newspaper will be for the Yale Daily News staff once they graduate, her methods are hilariously insane, even for her. She was great at running everything in high school, why is she so terrible at leading people all of a sudden? But really the main plot point of this episode is Lorelai meeting April, totally blindsided, in about the cruelest way possible. Like Lorelai, April is growing on me; it’s pretty cute about how excited she is about filling the salt shakers. But Luke’s inability to inform Lorelai of this revelation makes no sense and is all on him. Terrible things are about to happen to Luke, but he is such a lunkhead in these episodes (it is so obvious that Lorelai is devastated about postponing the wedding), it’s hard to muster up any sympathy. It absolutely fits that Luke is a Scorpio. Is New Haven really that scary? Best moments these bleak episodes: More Mrs. Kim, who realizes that Lane is miserable and is even willing to clear the way for Zack so that her daughter can be happy again. Jet lag from Atlantic City? The whole “Taylor sneaking his way into the Winter Carnival by using various horrible accents” thing was so terrible, I refuse to discuss it. This week in Gilmore entitlement: Tracking down busy professors in the hallway to make up for the fuckup detour that you yourself orchestrated. Rory Gilmore has clearly never heard the valuable expression, “Your crisis is not my emergency.” Also, booking every single detail of your wedding without any input from your fiancee. One of the Yale Daily News staffers is “Russ Tamblyn.” I never noticed the plethora of Gilmore Girls’ West Side Story references before, but now it seems like they appear every week (Riff and Bernardo last week). Despite her impassioned speech, naturally Rory living in a crappy apartment lasts only for a few episodes. It sure is strange how Anna goes from a nice, reasonable woman in these episodes to a crazy person trying to keep Luke from his daughter in season seven. Especially since she’s dating Jess’ dad. I kid, but still: awkward overlap. I also like to totally split infinitives. I can’t believe I can’t even like this episode even though my name’s in the title. Since this is probably not your name, you are likely not aware of this, but: There are very few famous Gwens. There’s Stefani, and dancer Verdon from Damn Yankees, and the awesome journalist Ifill (R.I.P.) That’s pretty much it. Best Gilmore outfits: Rory’s outfit of red sweater, gray circle skirt, and lace-up boots would be cute if she was at least wearing tights or something, as it’s supposed to be snowing outside. 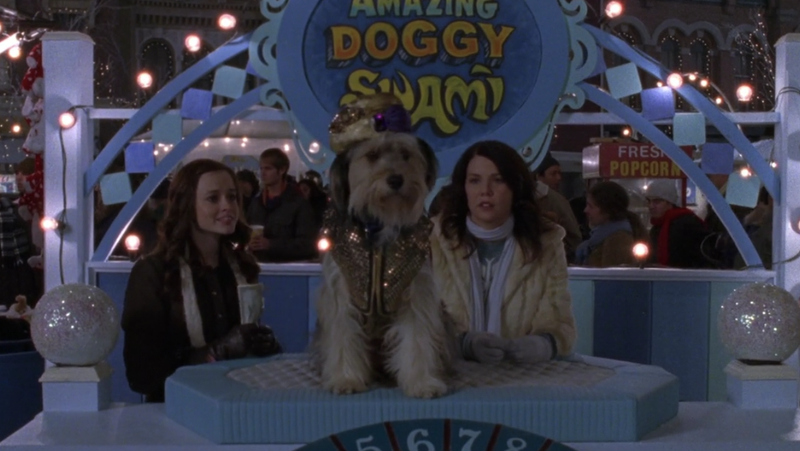 And Lorelai’s pretty black coat that laces up the back would be even better if she actually had buttoned up the front. Let’s just pretend it’s really January in Connecticut, okay? Worst Gilmore outfits: Lorelai wearing a boxy army jacket just like her fiancee. And what was up with Paris’ various horrible pantsuits? Next week: The Gilmore throwdown to end all Gilmore throwdowns.